发布时间 13日 八月 2013 通过 乔恩·斯卡夫 & 下一篇： 旅行. 最近更新时间 6日 一月 2016 . 就在我们今年我们的旅程掀起, 我注意到 一张照片 on face­book, pos­ted by a “page” I fol­low called Vis­it­I­era­petra. It was a photo of a beau­ti­ful look­ing fresh-water gorge, appar­ently very near to Iera­petra in South-East Crete. Hav­ing vis­ited Iera­petra over 20 times and hav­ing friends who live there, I thought I’d prob­ably seen all of the loc­al high­lights, but I’d nev­er heard of this gorge. A bit of research on google indic­ated that the gorge wasn’t par­tic­u­larly well known, at least to Eng­lish speak­ers. I gathered togeth­er what inform­a­tion I could and made a vow to find the place. 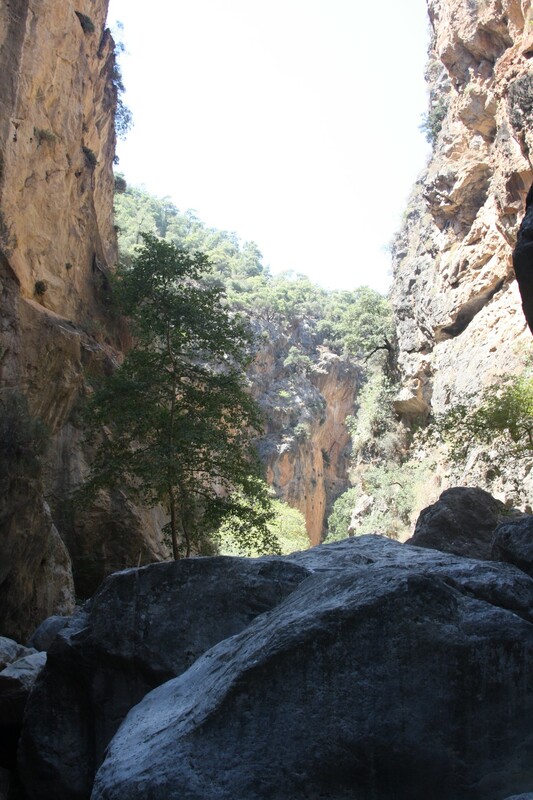 After sev­er­al days get­ting settled back in Crete we set off to find the gorge. 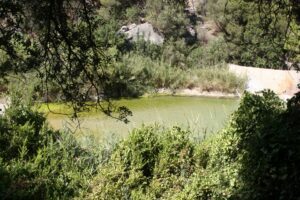 I had a sus­pi­cion that I knew where the trek star­ted as a couple of years pre­vi­ously we’d dis­covered a river a short dis­tance from Iera­petra, and with fresh water being fairly rare in August in South-East Crete it seemed the logic­al place to start. Luck­ily it turned out to be the right place. The gorge called Sarak­ina Gorge, but is also known as Myr­tos Canyon and to loc­als as Sarantapi­hos. On google maps the river is labelled as “Myr­tos Pot­amos” (即. Myr­tos River) although it is more cor­rectly called Kri­opot­amos. You will need foot­wear that you would con­sider suit­able for a “scramble”; I wouldn’t recom­mend flip-flops for example! 一样, 你很可能让你的脚在水中, so expens­ive shoes or train­ers might not be the most sens­ible option either. I wore some “flossy shoes” which are effect­ively plim­solls. There are a few parts which would be a con­sid­er­able chal­lenge to any­one with a ser­i­ous fear of heights, young chil­dren, any­one with a phys­ic­al dis­ab­il­ity, or any­one eld­erly. I would sug­gest the route is prob­ably doable for any healthy indi­vidu­al aged 8 to 70, but I’d exer­cise con­sidered judge­ment at both ends of that scale. 所以, before I go any fur­ther I’ll give some clear dir­ec­tions (走陆路) to the bot­tom of the gorge, as I haven’t been able to find any in Eng­lish any­where else. 该峡谷是刚刚超过 4 miles from the vil­lage of Myr­tos. From Iera­petra drive West along the South coast on the main road (called “Iera­petra-Arkalo­chori­ou” on TomTom, and called “Epar.Od. Pachi­as Amou — Gdo­chia” on Google Maps). Pass through Gra Ligia and Stomio and con­tin­ue towards the vil­lage of Myr­tos (loc­ated 8½ miles West of Iera­petra). Just as you enter Myr­tos you cross a river­bed on a bridge. This is the river­bed that the water would flow down, but it doesn’t reach the coast as it is col­lec­ted upstream, pre­sum­ably for agri­cul­tur­al usage. Whilst it would be pos­sible to walk up the river­bed (or the road along­side it) this would be sev­er­al miles in the hot sun, so I’d recom­mend stay­ing in the car for now. Fol­low the main road past Myr­tos which curves away to the North (在右边), back up into the moun­tains. 0.85 miles after cross­ing the river­bed by Myr­tos you will see signs for a right turn towards the vil­lage of Mythi. There is also a sign in Greek and Eng­lish point­ing to the gorge. Fol­low this road, 之后 1.6 miles you will pass through the vil­lage of Mythi. Con­tin­ue along the road, which will still have sign­posts to the gorge. Mythi以后的路又开始下降. After anoth­er 0.65 miles the road appears to be cross­ing the river­bed again and start­ing to wind back up. 这里, 在左边, is a gravel park­ing area and some con­crete struc­tures. You should also be able to hear run­ning water. 停放在碎石区. Con­grat­u­la­tions, 你已经到达开始! 一旦你停 (and had a look at the con­crete con­struc­tion that “dis­ap­pears” the river itself into a hole) 你可以掀起了峡谷. 有在停车场左侧的一些步骤与树木笼罩着他们. 爬上这些和顶部 (那里是只有 30 左右步骤) 道路右转, par­al­lel to the river. You can fol­low this for a couple of hun­dred metres. After this the scram­bling begins. I sus­pect it is pos­sible to walk the gorge without get­ting one’s feet wet (至少在八月), but to do so would be quite a chal­lenge. With the tem­per­at­ure in the 30’s and appro­pri­ate foot­wear we opted to walk in the water in some places. 也有一些地方，一块巨石 (3–4m high) must be scaled – in these places con­sid­er­able hand and foot holds have been cut well into the rock. The route isn’t always obvi­ous (although in a 10m wide canyon there isn’t much search­ing to be done) but there are faint yel­low arrows painted in quite a few loc­a­tions, 绘在岩石上属于路线的一部分红色方块. 使用这些 (and the obvi­ous carved foot holds) makes find­ing the best route rel­at­ively straight for­ward. 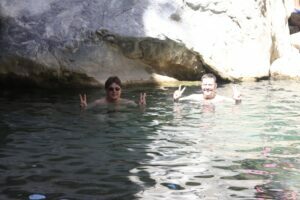 之后，约5亿 (对我而言相当粗略估计) you reach the only decent depth part of the river in this part of the gorge – a pool which is around 7m wide by 8m long and 2m deep at its deep­est point. 这就是，如果你愿意的话去畅游的最佳去处. 也, 这里后有一对夫妇具有提供一条绳子，以帮助棘手的部分. If you have any less con­fid­ent mem­bers in your group this would be a good place to stop before head­ing back. If you’re con­fid­ent enough on the rope there is only a couple of hun­dred metres to go before you emerge from the gorge into a more gentle val­ley where the river is slower and there are lots of trees and plants. 这是据我们去. I under­stand that we walked the “first” of 3 parts of the gorge. The second part is the gentle val­ley area with the tree and plants (espe­cially bam­boo). After this there is appar­ently a third part of the gorge which has much deep­er water, where swim­ming might be required. 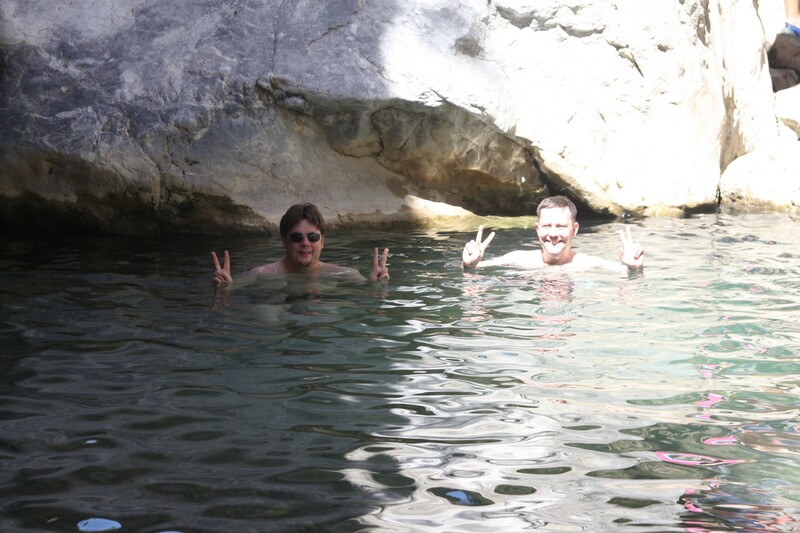 在八月 2014 I returned to Sarak­ina gorge with 4 朋友. 今年有几乎没有水峡, 即使我们去几乎相同的日期作为 2013. We all climbed up the rope at the end of the first sec­tion and explored fur­ther. The second sec­tion is very easy as it is just a gentle stroll along a wide flat river­bed with part of the walk along a dirt road. 在本月底有一个叉的地方 2 河流加盟. 我们探讨了2亿的每个叉子. The west­ern (左手) fork quickly becomes very dif­fi­cult to fol­low whilst the east­ern (右手) fork con­tin­ues to be wide and gentle. It is pos­sible to walk back along the dirt road up to a paved road, 并从那里回来沿着柏油路到峡谷的起点. We did not explore any fur­ther, but hav­ing done some more research I am hop­ing to explore the east­ern fork much fur­ther in 2015. 在 2014 I again walked in plim­solls. My bet­ter half wore her beach shoes, and anoth­er mem­ber of our party did the full walk in his flip-flops. 当水位低 (即. in sum­mer) these kinds of foot­wear are suit­able, although prop­er san­dals would be the ideal. 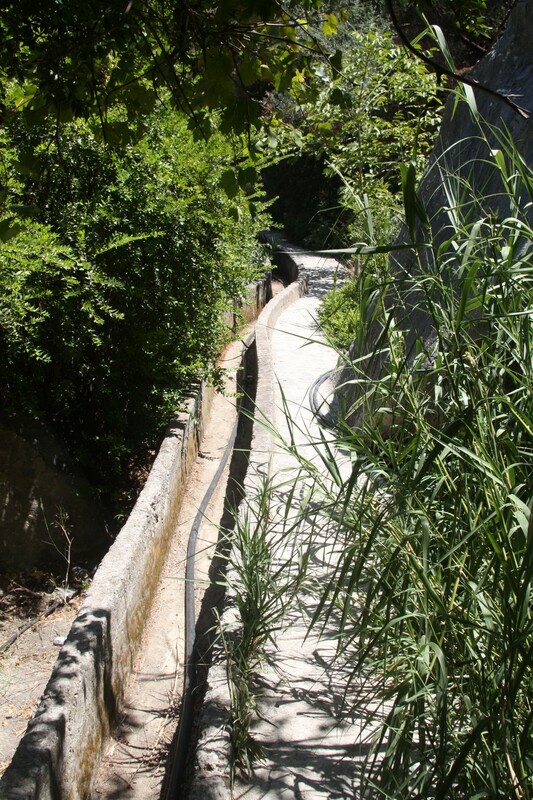 Oth­er reviews I have read insist on prop­er walk­ing shoes being the answer but I assume these must be refer­ring to much earli­er in the year when there is a lot more water and it is neces­sary to take a more chal­len­ging route along the sides of the canyon. 认为我们已经错过了什么? 让我们通过下面的评论知道. 如果您想订阅，请使用菜单上的订阅链接右上方. 您还可以通过使用下面的链接社会分享这与你的朋友. 干杯. A great help thanks we couldn’t find any detailed info else­where, we are hop­ing to go tomor­row with two 15 year olds. Shame there’s no water though.